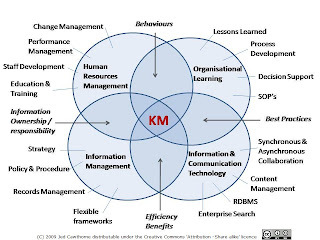 So where does ECM fit into this picture. Well its in the conjunction of Information Management and Information & Communications Technologies, exactly where the arrow labelled "efficiency benefits" is pointing ! I look at this way, those that believe in Knowledge Management as a concept generally agree that it is enable by good information management. In its turn content management is about the stewardship of unstructured information, in other words that which does not easily fit into the rows and columns of a relational database. In other words, an ECM strategy can be a vital part of a broader KM strategy. So should you be rushing out and investing lots of money in shiny new ECM software during the downturn? Well maybe, or you could focus on the management of your information assets, your intellectual property, which is often one of your most valuable sources of competitive advantage. You can do much to improve information management without investing in new platforms, by investing in staff development and education (note thats generic IM education - not 'training' for a specific piece of software!). However if you do have good enough cashflow to be able to invest in software, now would be a good to time to negotiate a good deal from vendors who also need to safeguard thier own cashflow. Of course developing a good business case and ROI arguements for better provisioning the management of your vitally important information is going to be even more important, but whether your ECM requirements are focused on up-front scanning, document and records management, or digital asset and web content (or all of them!) ECM technologies can also help you make the most of your storage environment and your investments in 'tin' via single instane storage, automated retention and disposal and even heirarchical storage management. So whether your goals are improved efficiency overall, revving up a sagging ECM strategy, or 'knowledge enabling' your organisation, now is as good a time as any to consider your strategies and Prescient Digital Media can assist you in your strategising!